Preparations for the biennial Dutch Historians’ Days (from the 22th tot the 24th of August 2019) are in full swing. The three-day event, jointly organised by the Royal Netherlands Historical Society (KNHG) and the History Department of the University of Groningen (UG), are meant for everyone interested in history, professionally or otherwise. The event showcases the many diverse and dynamic ways of doing history. Through a wide spectrum of lectures, debates and workshops the Historians’ Days tackle issues and challenges on the frontline of historical research and public debates. Keywords include networking, inspiration, orientation, career and relaxation. The Historians’ Days are modelled on well-known, influential and professional conferences abroad, such as the annual gatherings of the American Historical Association and the biennial Historikertag of the Association of Historians of Germany. The Historians’ Days 2019 evolve around the theme of Inclusive History, and promote diversity in participants, audience, program, stories, methods and presentations. In order to participate you can registrate through the registration form. The form is in Dutch. If you need assistance with filling in the form, please contact info@historicidagen.nl. The price includes the full program from 22th until the 24th of August. It is not possible to buy a ticket for one day only. If you want to stay overnight, we have arranged a discount with several nearby hotels. You can registrate by using this form, and using the code ‘participant’. The form is in Dutch. If you need assistance with filling in the form, please contact info@historicidagen.nl. The Historians’ Days are an initiative of the Royal Netherlands Historical Society (KNHG), organised biennially in close cooperation with a Dutch university. The university partner for the 2019 edition is the University of Groningen. 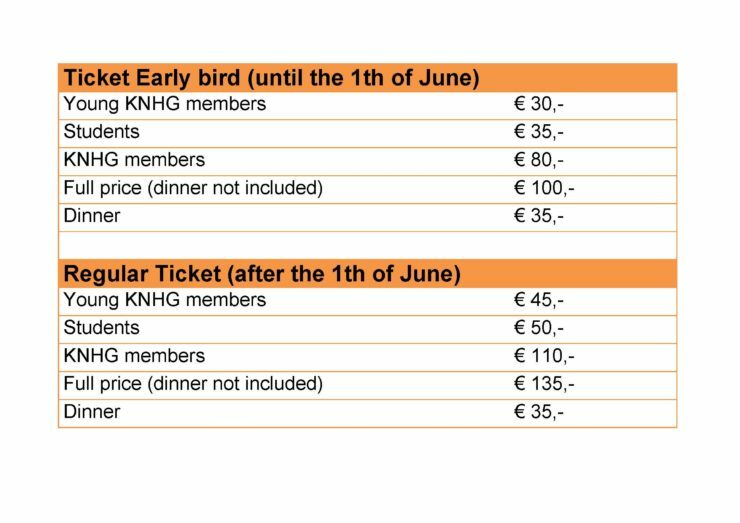 KNHG is the professional society for historians in the Netherlands. Under the banner of ‘Teaming up for History’, KNHG brings historians together and promotes the interests of the discipline. The Department of History at the University of Groningen is, with a yearly intake of about 180 students, one of the largest history departments in the Netherlands. A staff of over fifty academics work on and teach a wide range of historical topics and disciplines. Each edition of the Historians’ Days has a different theme. The Groningen edition has chosen the theme of Inclusive History. Today history is more relevant than ever. Almost daily we are confronted with references to our past. Yet, our understanding and perception of history is rooted in the present. It is moderated by contemporary scientific, political and societal debates and is often determined by whoever matters and by whoever is eligible to participate. Emancipatory movements have paved the way for a necessary rewriting of ‘established’ histories, for instance recently the Dutch government issued a directive to speak of ‘colonial wars’ instead of using the until recently politically acceptable terminology of ‘police actions’. Even though historians are overly aware of mechanisms of inclusion and exclusion in history, these mechanisms are still (perhaps silently) very much part of our discipline. This has, of course, consequences for the histories written. We continually have to face the question who writes what kind of history for whom? How do we select our sources? What is acceptable in ‘good history’? With the selection of Inclusive History as its theme, the Historians’ Days 2019 focusses on identifications in history rather than framing identities in an essentialist way. The theme Inclusive History provides an excellent platform for many different historians, stories, sources and methods, and can therefore serve a variety of interested audiences. The Historians’ Days 2019 will take place in the city centre of Groningen. The official opening is scheduled at the University’s Academy Building. This will also be the location of the keynote lectures on Thursday and Friday, and the reception on Thursday afternoon. All other events are organised in sections 12, 14 and 15 of the university’s Harmony Complex, home of the department of History, located within walking distance from the Academy Building. All history professionals can take part in compiling the programme for Historians’ Days 2019. Via a Call for Papers everyone is invited to submit suggestions for papers, presentations, sessions, workshop etc. The submission deadline is 28 January 2019. A programme committee will select proposals and put together the definite programme. The programme should reflect the theme of Inclusive History and includes (keynote)lectures, (research)papers, Sessions and Controversies. Contributors are also encouraged to choose innovative formats and presentation methods. The programme includes several keynote or plenary lectures. Two keynote speakers have been confirmed already: Catherine Hall FBA (Professor of Modern British Social and Cultural History at University College London) and Wayne Modest (Professor at the Faculty of Humanities at the Vrije Universiteit Amsterdam and director of the Research Center for Material Culture at the National Museum of World Cultures, Netherlands). The one hour keynote lectures will be held in the Academy Building on Thursday evening and Friday morning. The Controversies are meant to provoke debate. They relate to pressing current issues and discussions from the various fields of historical work, be it academia, teaching, museums, archives, politics or policymaking. Controversies enable interdisciplinary work and cross fertilisations, with regard to both content and participants. Sessions are meant for individual- or group presentations on innovative historical research. They can also serve as ‘working labs’ aimed at the presentation of new projects and approaches, in particular in teaching and educating in schools and heritage institutions. Sessions on the application of new digital research methods and presentation techniques could also be accommodated here. We encourage Controversies and Sessions that fit the theme of Inclusive History, but other subjects will also be accommodated. The latter can be specialist in nature, but ideally would involve and appeal to participants from different historical fields. art historians, literary scholars and others working in historical fields outside the ‘traditional’ history department. We particularly invite historians working in new and ‘less traditional’ settings, such as organisers of historical public events, journalists, policymakers. We invite you to respond to our Call for Papers. You can submit documents through the registration form. The form is in Dutch. If you need assistance with filling in the form, please contact info@historicidagen.nl.